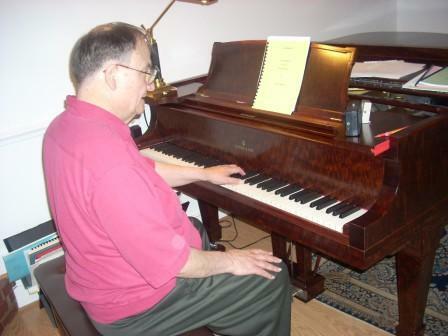 Spencer Fellows, long time teacher, performer, editor and transcriber, opened the eyes and ears of our members to the many facets of piano literature for the left hand alone. Spencer and his wife, Jennifer, have maintained a studio in Bethesda, MD, for 28 years, each pursuing piano performing careers since childhood in addition to their teaching. Spencer studied violin as a teenager and classical guitar in college. His interest in guitar peaked after hearing Andre Segovia. He began to study guitar seriously--which can be detrimental to piano playing since the guitar calls for long nails on the plucking (right) hand. In the Paris of 1915 there were many one-armed men as the result of amputations. With no antibiotics to prevent infection, amputation was the method of choice for serious hand/arm injuries. Most such injuries happen to the dominant hand, which is usually the right hand, especially at that time since left-handedness was strongly discouraged in children. The advent of World War I vastly increased the problem among the veterans. One such man was Paul Wittgenstein, a one-armed pianist who once held a concert for a hall full of one-armed men. Many pieces have been written for left hand alone, but there is a dearth of great music (of the Bach, Beethoven, Brahms caliber). The Ravel Left Hand Concerto--in which the orchestra heavily reinforces the left hand part--is possibly the greatest piece of music ever written for the left hand. Wittgenstein commissioned this piece, as he did many others. Brahms' transcription of the Bach solo violin Chaconne in d minor is one of the greatest pieces transcribed for left hand alone. Brahms originally intended a literal two-handed transcription but ultimately transcribed it for the left hand and lowered it one octave. Spencer has written his own transcription. Other transcriptions can be made from those most eloquent Six Unaccompanied Cello Suites. Spencer also feels that some Bach preludes transcribed for the left hand are quite successful as well. H. Berhens wrote an exercise book for the left hand. Leopold Godowsky transcribed many Chopin Etudes for the left hand alone (hard enough for two hands it would seem!). Mark-Andre Hamelin's CD of the Complete Studies on Chopin Etudes of Godowsky, of which 22 are for left hand alone, is exemplary. Paul Wittgenstein, mentioned above, wrote two books of exercises and one of transcriptions. Spencer played Mendelssohn's Nocturne from Midsummers' Night Dream from that collection and did a terrific job. The technical hurdles, like so much left hand music, result from the fact that the hand covers all the ranges of the piano, so it spends a lot of time in the air traveling between those ranges. All these transcriptions are of the very advanced literature. The issues and difficulties in repertoire for the left hand and Spencer's keen personal interest in the subject created a challenge for him--i.e., providing left-hand transcriptions of quality musical literature that are not too difficult and that pianists with small hands can successfully play. Spencer has written transcriptions from Schumann's Album for the Young that are geared for the smaller hand, and he played some of these transcriptions for us. Another transcription, the Riderstuck, presented more of a challenge since the notes cannot all be played as written, which is a common problem in left-hand transcriptions. Thus, the focus for the transcription was on preserving the spirit of the piece. Spencer pointed out that left-hand music and guitar share certain characteristics. Both must use the thumb as the cantabile melody line as the other fingers handle the accompanying voices. Classical guitar provides some accessible material for left-hand solo work, though it, too, is sometimes difficult to play, as Spencer demonstrated. Spencer performed his transcriptions of Gliere and the Grieg's Ich Liebe Dich and an encore of the beautiful but little performed original left-hand composition, Prelude Op.9 #1, by Scriabin. We all came away with an appreciation of how paying attention to the left-hand literature could help our two-hand work, for it strengthens the technique and music making qualities of the left hand when playing two-hand literature.